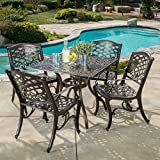 Our pick for the best patio furniture is Great Deal Furniture’s Odena Outdoor 5-Pice Cast Aluminum Square Bronze Dining Set. It is made of cast aluminum, which is a lightweight, strong, weather-resistant material. The set is sturdy, durable, and eye-catching. Our step-up pick is GDF Studio’s Calandra 5-Piece Cast Aluminum Circular Table Dining Set. 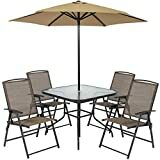 It is durable, rust-resistant, easy to assemble, and has a hole at the center of the table where you can insert an umbrella for shade. Patio furniture is also known as garden or outdoor furniture. Its main distinguishing factor is its durability in spite of the weather conditions. Such furniture is designed specifically for the outdoors, and is made using weather-resistant materials like aluminum. Outdoor furniture sets usually consist of one table and four or six chairs. It could also consist of a table and long chairs. The very best patio furniture is quite expensive, going for over $1000 and capable of lasting last for decades. However, not everyone can afford such expensive sets, and this article is targeted at the average consumer. You want a decent patio furniture set, but you don’t have $1000 to spend. We will focus on sets that cost under $600. The main classifications under this category include acacia, eucalyptus, and teak wood. Of these, the best is teak. It is the most durable and the most expensive. You will struggle to find a decent teak patio furniture set for lower than $100. Eucalyptus wood is better than acacia, but inferior to teak. Wood requires more maintenance than other materials. It is subject to the action of moisture and temperature. Rain makes the wood swell and shrink – as does temperature (it is vulnerable to UV rays). Wood’s kryptonite is rot. To ensure durability, you must carry out annual maintenance on outdoor wooden furniture. There are companies that offer sanding and oiling services. If you don’t take care of your patio wooden furniture, it will gradually change color and become silver gray. In spite of this, wood’s popularity has not lessened. It is familiar, classical, warm, and inviting. Teak is particularly rich in such virtues. For instance, when teak weathers, it develops a majestic, silver-like glow. For most people, this aged look is even more attractive than the original one. In addition, teak is resistant to rot and infestation, and therefore does not require a lot of upkeep. Another attractive quality of wood is its ability to retain a moderate temperature even on the hottest days. Metal, on the other hand, becomes too hot to sit on. Metal’s kryptonite is rust. The main metals used in making patio furniture are cast aluminum and steel. Since they are vulnerable to rust, they are usually treated with rust-resistant coatings for protection. In case of rust formation, sand or scour it off using sandpaper, and then repaint the metal – spray paint it. One of the best metals for patio furniture is cast aluminum. It combines two important qualities: strength and lightness. Accordingly, cast aluminum sets are more expensive than sets made from other metals. There are three types of aluminum patio furniture: cast aluminum, extruded aluminum, and wrought aluminum. Cast aluminum is made by pouring molten aluminum into molds, a method which enables more intricate designs than extruded aluminum. Cast aluminum is lighter than wrought iron. Extruded aluminum is created by forcing the metal through a die, a process which creates a lighter metal than cast aluminum. Wrought aluminum is not poured into a mold. It is manipulated into shape. It is heavier than both cast and extruded aluminum. It is also the most durable of the three aluminum types. It is also known as all-weather wicker. Unlike traditional wicker furniture, it is made of steel or aluminum wire wrapped with plastic or paper material. It is durable, and requires less maintenance than wood. All you have to do is wipe it down using a damp cloth. In extreme cases, you can hose it down. It’s wise to cover your tables and chairs to protect them from UV damage. Exposure may cause the plastic resin to deteriorate and suffer breakage. Plastic is lightweight. At the same time, it is weather-resistant, and it is not expensive. Cover it when not in use for increased durability. In this article, we will narrow down the focus on patio furniture sets. Some of these sets come with an umbrella-covered table, and some do not. You can get patio sofas in a variety of shapes and styles. Some look like your regular living room sofas while others look flimsier. Examples of patio sofas include outdoor sectional sofas, loveseats and full-sized couches. Choose your patio sofa on the basis of comfort and the number of people it can accommodate. Patio chairs may either resemble dining table chairs or comfortable, overstuffed living room chairs. You can also get outdoor recliners, hammock chairs, papasan chairs, or club chairs. Lounge chairs are popular for their use in sunbathing, especially next to a swimming pool. They come in many styles and fabrics. Lounge chair materials include wood, wicker, and mesh. A costlier, more elegant, and perhaps more comfortable option would be upholstered lounge chairs. Choose lounge chairs that aesthetically match the rest of your outdoor furniture. Patio tables look like regular dining tables. They usually come as part of a set together with chairs. Materials include glass, wood, plastic, and iron. You can get them in a variety of sizes and shapes. Most are round. Some have a hole in the center into which you can insert an umbrella to provide shade for people seated at the table. We classified the sets according to material. For each material, we came up with the best patio furniture set in that category. The more people a set can accommodate, the more expensive it is going to be. The sets available at the price range this article is targeting usually consist of one table and four chairs. Costlier sets can seat seven people or more. Most people want something that will be easy to clean, something that will not require too much maintenance. Patio furniture spends its lifetime exposed to the elements. Rainwater, temperature, UV rays – all these can cause deterioration over time. It succumbs to rot or rust, and begins to fade. The best patio furniture should be able to handle exposure to the elements for long with minimal deterioration. 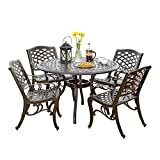 Our best patio furniture set is Great Deal Furniture’s Odena Outdoor 5-Piece Cast Aluminum Square Bronze Dining Set. It is made of cast aluminum and is water resistant. The set comprises one table with four dining chairs. It is one of the best sets for family outdoor dinners. At the center of the table is a hole made to fit an umbrella, enabling you to stay cool even on the hottest days. It is the best choice for summer days. The aluminum finish is weather-resistant, which means the set will comfortably handle all kinds of weather conditions throughout the year. The set is sturdy, and has attractive details that make it an eye-catching addition to your patio. The Odena Outdoor 5-Piece Dining Set is easy to assemble and does not take a lot of space. Additionally, the chairs are comfortable. We wish the table was a bit wider. However, this is no deal-breaker. Wider tables come in at higher prices and are out of the budget range we are targeting in this article. Our second-best choice is GDF Studio’s Calandra 5-Piece Cast Aluminum Circular Table Dining Set. As a five-piece, it includes one cast aluminum outdoor dining table and four cast aluminum outdoor dining chairs. The cast aluminum ensures durability and rust resistance. The bronze finish gives the set a beautiful appearance. The hole in the middle of the table will hold an umbrella, giving you and your family shade on hot summer days. The set requires assembly, but installation is easy. You can get a good outdoor furniture set at an affordable price too. Our budget pick is the Best Choice Products 6-Piece Outdoor Folding Patio Dining Set. One of the best things about it is its capacity, which is remarkable for its price: you get one table, an umbrella, and four folding chairs. The chairs comprise a powder-coated steel frame, sling fabric, and a high back rest. They fold smoothly, making them easy to store or relocate.The steel and the polyester fabric from which the set is constructed ensure protection against outdoor weather. 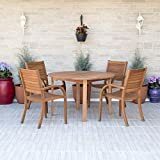 Our best eucalyptus outdoor furniture set is the Amazonia Arizona 5-Piece Eucalyptus Round Dining Set. Eucalyptus is not the best type of wood for patio furniture (teak takes the crown), but it is better than acacia. It consists of a round table and four stacking chairs, all made of eucalyptus wood. The chairs come already assembled, but you will need to assemble the table. The table has a two-inch hole at the center where you can insert an umbrella to provide shade. The chairs are stackable for easier storage. It comes with free sealer protector to ensure strap durability. It will help protect against air pollution, mildew growth, and salt air. 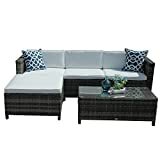 For the best wicker set, we chose the Patioroma 5-piece Outdoor Wicker PE Rattan Sectional Furniture Set. The best thing about it is its sturdiness and durability. It is made from commercial-grade, hand-woven, weather-resistance PE Rattan wicker and has a powder-coated steel frame. The seats have cushions and pillows, allowing for heightened comfort. The cushions are three inches thick, and are sponge-padded. Note, however, that neither the cushions nor the pillows are water-resistant. The best place to locate this set is in a covered patio space. The pillows and cushions have zippered polyester covers which you can remove and clean. The tempered glass on the table is also removable, which makes it easier to clean after use. Additionally, the tempered glass adds sophistication and beauty to the set. One of the best qualities of this set is its versatility. You can rearrange it to suit any formation, whether it is the patio, porch, garden, or even indoors. Aluminum patio sets are one of the most sought-after. 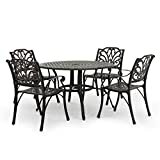 Our pick for best aluminum patio furniture set is Great Deal Furniture’s Covington Antique Bronze 5-Piece Cast Aluminum Dining Set. It consists of one round table and four chairs. The table has a standard umbrella hole in the middle, allowing for a cool time outside in spite of a scorching sun. The set comes with tools and instructions which make assembly easier. If you fancy an acacia patio furniture set, Great Deal Furniture’s Bowman Outdoor Dining Set may be your best choice. It is built from acacia hardwood which is smooth and has a rustic stained finish. It is an ideal set for a covered patio space. It comprises a picnic style table and two bench seats, allowing people to sit on either side of the table enjoying a meal under the shade. The set is easy to assemble, and comes with tools and instructions. For something that can do well in all kinds of weather, consider the Keter Corfu 4-Piece Garden Furniture. It has an ergonomic design engineered to give you and your family the best comfort. The frame is built in a natural-looking open-weave rattan-style. Since it is not made of metal, it is easy to maintain. On the same note, the non-metal frame has the advantage of being rust-proof. The set comprises a high-quality polypropylene resin construction which ensures that it will neither rust nor fade. The best quality of plastic patio furniture is the durability and hardiness. In addition, polypropylene is resistant to ultraviolet light. This gives the set a high temperature resistance, making it durable in spite of scorching hot weather. The set consists of one loveseat, two deep armchairs, and one coffee table. The chairs have weather-proof seat cushions. The cushions have a thickness of two inches, and are corded. The set is easy to assemble – you will not require extra tools to get the work done. It is also easy to rearrange, transport, or store, thanks to its lightweight build. 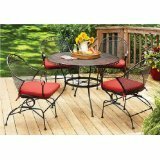 For the best wrought iron set, go for Better Homes and Gardens Clayton Court 5-Piece Patio Dining Set. The five-piece set consists of one table and four chairs with red cushions. It is marketed as being made of wrought iron, but it is in fact a steel frame. Steel is one of the best options for anyone looking for low-maintenance outdoor furniture. Steel is sturdy, and does not need regular upkeep. In addition, it is easy to hose down or wipe. The table has a generous size, and the rocking chairs come with cushions, ensuring that you can sit outside in comfort for hours. The cushions are resistant to water, stains, and mildew. Our best rattan set is the Goplus 4-piece Rattan Patio Furniture Set. The PE rattan wicker material used to make it is weather-resistant, hand-woven, and of commercial grade. The steel frame is robust and powder-coated. For comfort, you get lofty, sponge-padded seat cushions. The cushions have removable zipped polyester covers for easier cleaning. The table has removable tempered glass which gives the set a sophisticated look. The glass is also easy to clean after use. This set is best located in a covered patio space. It is great for your balcony, terrace, breakfast nook, patio, small deck, or the poolside. As we said, the best sets go for no less than $1000. But we are not looking at such in this article. We are targeting sets under $600. Some of those that didn’t make the cut were also too cheap – we did not consider any patio furniture sets going for below $100. We ignored sets that could only sit two people. We also excluded sets that were not strong or durable enough to handle outdoor weather conditions. Q: How long will my patio furniture last? A: That will depend on a variety of factors, the most important being material. If it’s teak, expect it to last a long time – but be prepared to dig deep into your pockets for a good set. Another important factor is care and maintenance. Always cover the tables and chairs when they are not in use as this will ensure greater durability. If it’s wood, remember to perform annual sanding or staining – there are companies that offer these services. Be vigilant, checking to see if there are any signs of rot or rust, especially at the joints. Perform paint touch-ups. Outdoor furniture is built to last. However, as in many things, you get what you pay for. The cheaper a set is, the less durable it probably is. On the whole, expensive sets last longer. Q: What type of seat cushion should I go for? A: The best quality to look for in outdoor chair cushions is hardiness. You need cushions that can resist stains, water, fading, and abrasion. At the same time, the cushion should be comfortable. For that reason, the best type of seat cushion for outdoor chairs is acrylic. You would probably never consider it for indoor chairs, but it’s perfect for the outdoors. Since it does not contain fabrics such as polyester or cotton, it is resistant to staining, mildew, and breakage. Q: Won’t the furniture get hot out there in the sun? A: Of course it will, especially the metal frame. Some metals retain the heat more than others. For instance, wrought iron and steel will retain the heat longer than aluminum which cools fast when it is moved into the shade. Wood won’t get as hot. That’s one of the reasons we recommend covering your set when you are not using it. The best scenario would be to place your outdoor dining set in a covered patio space. Q: Is covering the patio furniture really necessary? A: No, it isn’t necessary, but we recommend it. It’s a way of extending the lifetime of your outdoor tables and chairs. It’s also a way of reducing the need for cleaning and maintenance. Q: How should I clean and maintain my wooden patio furniture? Begin light: sweep the surfaces of the furniture with a soft cloth or brush. After you are done, you can decide if the set needs extra cleaning. Use a mild soapy solution to clean it. Non-detergent liquid soap (like dish soap) is the best choice for cleaning patio furniture. It cleans without causing harm to your set or to the environment. In case of tough stains and mildew, you can clean with water and white vinegar. Your user’s manual should have instructions on how to clean and maintain your set. Cover the furniture with something waterproof when you are not using it so as to protect it from rain, snow, and snow. Use breathable covers. Sand and stain or oil the table annually – how often depends on the degree of exposure to the elements. Q: How should I clean and maintain my metal patio furniture? Most metal sets have a protective finish. Use a cloth and mild, non-detergent soapy solution to wipe the tables and chairs down. Do not use abrasive scrubbers or cleaners as such might scratch the finish and expose the metal to moisture. In case of ingrained dirt, wash with window cleaner or a non-abrasive multi-purpose cleaner. Be keen to identify where there are scratches or signs of rusts. Check the joints in particular. In case of rust, apply touch-up paint. In the event of mold or rust, work on the area with fine-grit sandpaper as well as rust-proof touch-up paint. When working on aluminum surfaces, use a solution of equal parts white vinegar and water. Don’t use alkaline cleaners as these will cause oxidation on the aluminum furniture. Clean off bird droppings immediately. They are highly corrosive and may cause permanent staining and corrosion. Bird droppings contain uric acid. To extend the furniture’s lifetime, cover it when you are not using it. Breathable covers are the best as they prevent the formation of mold. When experiencing winter weather, it’s wise to store the chairs and tables indoors, if possible. 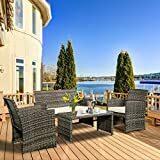 Q: How should I clean or maintain my resin wicker patio furniture? Use a damp cloth (soapy or just water), and wipe down. In case of extreme dirt, you can hose it down. In the event of mildew and tree sap, use relevant cleaners like mildew-remover and so on. Afterward, rinse off the cleaner by hosing down the furniture. Cover your tables and chairs with a breathable cover when you are not using them so as to give the plastic resin protection from UV damage. Q: How do I clean the patio furniture cushions and canvas? Take one teaspoon of dishwashing detergent and one teaspoon of borax and mix in one quart of warm water. Pour the resulting solution in a spray bottle. Saturate the cushions surfaces (inside and out) with this solution. Be generous in pouring the solution as this is what will clean off the mildew and mold. Ensure you saturate every crease and crevice. Give the cleaning solution 15 minutes. After that, hose down the cushions thoroughly with water to remove both the dirt and the cleaning solution. Peg the cushions on the clothesline and let them dry, but not completely. Spray the slightly damp cushions with fabric protector. It will make future cleaning easier as well as protect the material. You can machine-wash it, and then put it back on the furniture. Ensure it is still somewhat damp when putting it back on as this will allow the material to stretch back into the best shape. If you cannot take off the canvas, you can instead work with a scrub brush. Rub the brush across a bar of Fels-Naptha stain remover soap, and then rub it in a back-and-forth motion on the canvas for a while. Be generous in lathering the canvas with the soap. The stain remover soap will get rid of bird droppings and other stains. Finally, hose down the canvas with water to rinse it off. Q: How do I clean the patio umbrella? A: You work with a soft-bristle brush. Dip the brush into some water, and then rub it across a bar of laundry soap. Rub it over the open canopy of the umbrella, in a bottom-to-top movement. When you are done, hose it down with water to rinse it off. Don’t close the umbrella – leave it open until it dries. Whenever you notice bird droppings on the umbrella, be quick to wipe them off. Bird droppings contain uric acid, and are highly corrosive. They are so corrosive that they even cause damage to building materials. Q: Won’t my furniture blow away in the wind? Purchase heavy furniture in the first place. Metals such as aluminum, steel, and wrought iron are heavier than wood, plastic, and wicker. Wrought aluminum is heavier than both cast aluminum and extruded aluminum. Cast aluminum is heavier than extruded aluminum. The heavier the material, the greater the difficulty of relocating the set, so weigh your options carefully. Additionally, iron and steel can leave marks on your deck or patio. Plant a windbreak. By “windbreak” we mean a cluster of thick trees or plants that will reduce the amount of wind coming to your patio. When the winds are harsh, they may still get through, but with a diminished force. In addition, the trees give your compound a green, beautiful look, and improve the environment. Get a weighted base for your patio umbrella. The umbrella, if you think about it, is sort of like a sail sticking out of the table. When the wind blows, the umbrella is the first thing it sweeps away. For that reason, weighted bases are indispensable. The weighted base is usually filled with water or sand, and gives the umbrella the firmness it needs to survive the wind. Stack the chairs. When not using your lightweight patio chairs, stack them and store them in a corner. Otherwise, they are liable to succumb to the power of the wind. Additionally, in case of rain, you won’t have to wipe off each chair. Use earthquake gel. This is a gel which you place on the bottom of the table and chair legs. It holds them in place. Its original use is to prevent glass from slipping off furniture during earthquakes. If you want to move the table or chairs, just remove the gel. You can get the compound for an affordable price at hardware stores. Q: Tell me more about weighted bases and how to use them. A: First, you must figure out how much weight you need. The table below will help you understand the requirements for weighted bases. Q: In the table, the largest patio umbrellas use either a supplemental weight bag or a cantilever umbrella base. What are they? A supplemental weight bag is used in conjunction with a regular umbrella base. It adds weight to your already in place base weight, helping hold down an over-large umbrella. It sits on top of the umbrella base with a weight of up to 100 lbs. Cantilever umbrella bases also work with aftermarket umbrellas. They have a weight of up to 125 lbs. They come in a range of designs – for instance, water-based weights, weights that also act as planters, and four-piece, clover-like design systems. Q: What other factors should I consider when shopping for the best patio umbrella base weight? Base weight profile/thickness. Some are as thick as 6 inches plus. Some are super thin. Thicker bases may be heavier, but they are also aesthetically unattractive and can be hindrances to the freedom of moving the furniture or stretching your legs. Maneuverability. Some bases come with wheels, which enable you to move the umbrella around different parts of the patio. Umbrella shaft size. Most shafts are in the 1 to 2-inch thickness range. While most base weights will accommodate poles this thick, there is variance in exact dimension from product to product. The umbrella shaft diameter should be smaller than the base’s diameter so that it can easily fit in the base weight. Q: How do I repaint outdoor metal furniture? Work on the metal surface with a wire brush, gently scrubbing to and fro so as to remove loose pieces of rust. Now you work with a palm-sander to get rid of the remaining rust. In case you don’t have a palm sander, do it by hand, though that will take longer. Use 80 to 100-grit sandpaper and work on the entire piece of furniture. The lower the number of the sandpaper, the coarser it is, which helps remove more material. Don’t forget the hidden, hard-to-reach places. You may not be able to get at them with the palm sander. Sand such places by hand – places like the curves of a chair’s legs and arms. After getting rid of most of the rust, take a 150-grit sandpaper or higher, and continue working on the entire surface of the chair. Work until it feels smooth when you touch it. Wipe down the smooth surface with acetone to prepare it for priming and painting. Use an anti-rust spray primer to prime the chair’s surface. For uniform coverage, work with darker primer under darker colors and white primer under lighter colors. Spraying slowly at a consistent spraying pattern will ensure there are no drips or overspray. In spraying, follow the natural lines of the chair. Spray the underside and the back as well – it is an outdoor chair after all. Consult your primer’s label to find out how long this particular brand takes to dry. After it has dried, sand the primed surface lightly using very fine sandpaper. After sanding, wipe the dust off with a tack cloth. Paint with an anti-rust, oil-based spray paint. In spraying, use a back-and-forth motion. Hold the can away at a considerable distance to prevent overspray and drips. Follow the chair’s natural lines. Paint the back and the underside too. Two or three light coats of paint will do. Let the paint dry to the touch before applying a new coat. In case of a drip, rub- the area lightly with a clean chip brush. It will stop the flow and smooth it out. Apply outdoor clear coat (a sealer) to the painted surface. It will give your chair extra protection against rust. Use a clear oil-based urethane made specifically for outdoor use. The best option will also have UV protection to guard against fading. Holding the can at 10 to 12 inches away, spray the surface back and forth while following the natural lines of the chair. Sand lightly between coats using a 200-grit or higher sandpaper – it will ensure a smooth finish. Allow your chair to dry/cure for 24 hours in a dry, warm, properly-ventilated area. After that, the chair is ready for use. It will give you good service for a long time. Q: How can I keep warm at night while having dinner out on the patio? Our choice for best patio furniture set is Great Deal Furniture’s Odena Outdoor 5-Pice Cast Aluminum Square Bronze Dining Set. We chose it because of the material (cast aluminum), which is strong and durable. We also loved that it has a hole in the middle for a patio umbrella to fit in and provide shade to everyone seated around the table.